We do not curently have theatre tickets available for Clocks 1888: The Greener This could be because we have simply sold out or it could be that this show is no longer running. The information on this page remains purely for historical and informational purposes. A brilliant young migrant girl is single handedly running the towering clock that is the beating heart of the East End. When she is discovered by a gentleman explorer they are forced to choose between the worlds they know or each other. 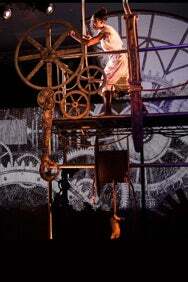 Composed by Martin Ward (Wind in the Willows) Brolly’s epic new opera tells a powerful story of love and survival that takes the audience on an extraordinary journey into the visually stunning animated world of the clock.